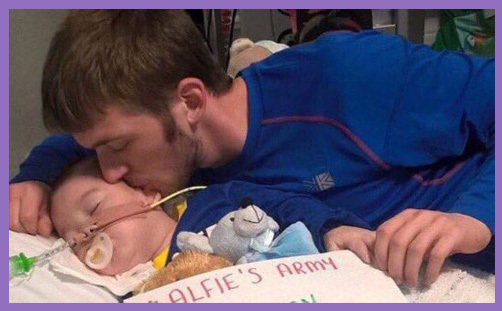 An awful lot has been written about the tragic case of Alfie Evans; so much, in fact, that there is absolutely no desire at all to add to the mountain range of fraught opinion, anger and incredulity that already exists across the mainstream and social media. It is a case that is shaming the country on the world stage: we have apparently become a nation which treats dying children worse then we treat sick dogs. Alfie’s parents have been criticised; their lawyers censured; the Christian Legal Centre denounced; Alder Hey hospital assailed; doctors abused and threatened, and some of the most outrageous smears have been levelled against the presiding Judge, Sir Anthony Hayden. There’s so much reaction out there it’s impossible to link to all strands of opinion on the matter. Just google ‘Alfie Evans’, and you’re bound to find something mind-boggling, jaw-dropping or profoundly (dis)heartening: there’s a moral and legal view for all dispositions. Ultimately this is about a little boy who is dying, and the rights of his loving parents to care for him in his last days. Somehow it has become a proxy culture war (or a series of unedifying skirmishes for moral supremacy) between those who believe the Government, Judiciary and doctors are complicit in the murder of a child; and those who believe the tyranny of the State must be resisted; that Alfie Evans must liberated from Alder Hey because it is behaving more like Auschwitz than the Good Karma Hospital. Alfie’s father, Tom Evans, is Roman Catholic, and Pope Francis has become involved. His Holiness has generously made arrangements for the boy to be flown by to the Vatican’s Bambino Gesu Hospital in Rome. Bizarrely, Alfie Evans has even been granted Italian citizenship in a last-ditch attempt to afford him further protections and facilitate the necessary diplomatic processes. You see how easy it is fall into contributing yet another diatribe of half-baked opinion or a polemic of ill-informed prejudice. What if, instead of a plea from a Roman Catholic father to fly his sick son to Rome, the request to Mr Justice Hayden (or to the Court of Appeal) had been made by a Muslim father to fly his sick son, Ahmed Edris, to Mecca? The question isn’t so much racial as it is religious: if the Pope’s offer had not merely been one of palliative care but of spiritual hope (made explicit), what would have been wrong with a pilgrimage to Rome? Or to Lourdes? Would the Court of Appeal have prohibited travel in the prayerful expectation of a miracle? If the dying son of a Roman Catholic father may not be taken to Rome (at the parents’ expense, please note), would the High Court be equally ill-disposed to permitting the dying son of a Muslim to be taken for a once-in-a-lifetime Hajj to Mecca, in fulfilment of the Five Pillars of Islam before he goes to meet Allah? Would a judge dare imperil the salvation of a soul? Would such a prohibition constitute an expression of anti-Muslim prejudice, ‘Islamophobia’ or religious discrimination? The point at which Pope Francis became involved in this case was religiously significant: it moved Alfie’s sad plight from the purely medical and legal to the spiritual and holy. You might balk at such bunkum and insist that the law is the law and medicine is science, but if certain sites and shrines may hold a special spiritual power, so might certain people manifest a special divine presence and hope: God is not limited by High Court judgments. If Alfie Evans had been permitted to fly to Rome, might it have strengthened his father’s faith? Might that faith have not then believed more earnestly? Might that more earnest belief have not better apprehended a numinous transcendent power? Might that apprehension not produce a miracle? Are not all things possible with God? Does compassionate palliative care in Rome not bring more healing to a sick boy’s soul than being left to die of hunger and thirst in Liverpool? Why should flawed doctors and secular judges sit in judgment upon prophecy or prohibit the signs of heaven? For the Christian – as Alfie Evans’ father reportedly is – believing in miracles is a fairly natural thing to do: the Christian Faith is founded upon them. You may be skeptical and scoff at the irrationality, but it would take a cold and callous heart to deny a loving father and mother that which their consciences feel is best for their son as he moves toward Christ’s everlasting kingdom. Certainly, the Pope is not God, and Rome is by no means a fixed star in a dark firmament. But they represent a flickering light of resurrection hope in a sea of despair and pain. Who or what should have the power over the people of God to deny them the sweetness of healing and the anointing oil of the Vicar of Christ? When it comes to distinguishing true grace from counterfeit compassion, it helps to look up to the Spirit of God rather than out to the wisdom of man. Tom Evans and Kate James pray that the sun might shine upon them, and that the Son might light upon their son. They simply long for something spiritual, supernatural and divine. Rome offered them that, just as Mecca might do for Ahmed Edris. You might consider this a peculiar religious delusion or absurd subjective sensation, but who made you the fount of all holy knowledge, or gave you a title to heaven?